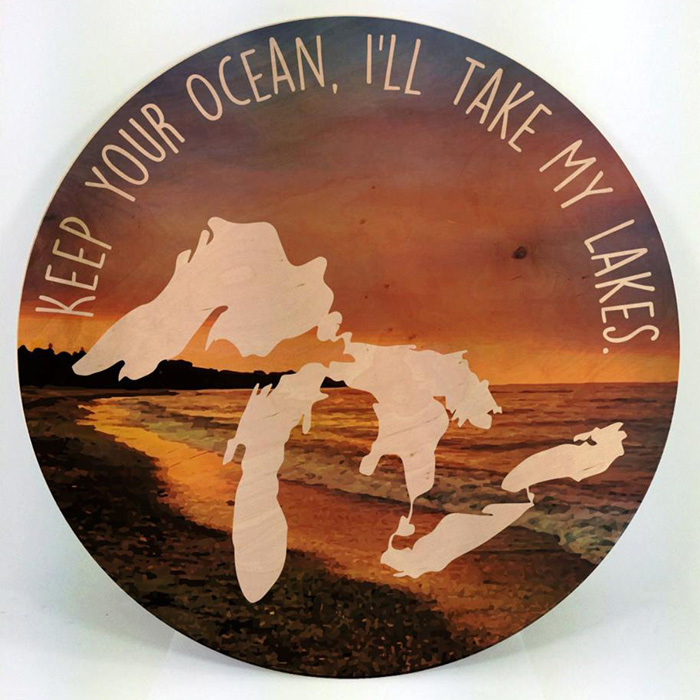 Solid Wood Michigan Lazy Susan made from ash with a beautiful Great Lakes Michigan design. Text on the top of the Lazy Susan is: “Keep Your Ocean, I’ll Take My Lakes”. This Michigan Lazy Susan measures 15″ in diameter. This Lazy Suzy is finished with food-safe, boiled, linseed oil to highlight the unique, natural character of wood and will achieve a natural patina over time making it beautiful for years to come. Minimal care is needed. Wash your Lazy Suzy only as necessary with warm soapy water to remove food oils, rinse and towel dry completely. Avoid soaking your Lazy Suzy and never put your Lazy Suzy in the dishwasher. An occasional application of oil and a buffing can enhance its beauty. Anytime your Lazy Suzy feels dry (once or twice a year) lightly oil it with boiled linseed oil or butcher block oil (available at hardware store or big box stores). Spread oil over the entire surface, let oil stand for a few minutes then wipe and buff your Lazy Suzy with a cotton cloth or paper towel. Oiled wood will darken over the years when exposed to air and sunlight creating a beautiful patina adding to the beauty and character of Lazy Suzy as it is passed down through generations. To slow the natural darkening process, keep your Lazy Suzy out of direct sunlight and avoid exposing to sudden changes of humidity or temperature. I am so happy I found this sight! My step son and daughter in law are in the Army and being stationed all over. The Michigan themed gifts give them a little bit of home.